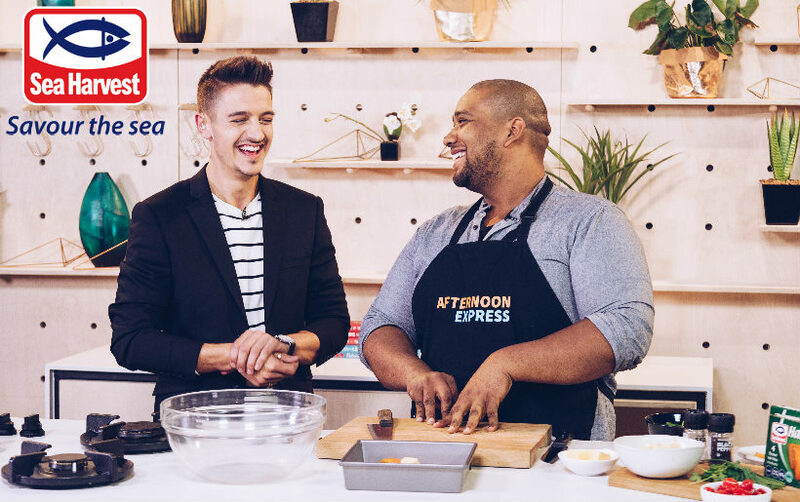 Have you ever wanted to cook your favourite recipe in the #AfternoonExpress kitchen? This is your chance! Sea Harvest is giving away a unique experience for our seafood-loving viewers! You could be cooking in the #AfternoonExpress kitchen with chef Clem as well as receiving a hamper to the value of R1,000! Create a unique recipe using any Sea Harvest product and post it on the Sea Harvest Unique Viewer Experience competition post on the Afternoon Express Facebook page, posted on 25 May 2017. 1.1. The Afternoon Express Sea Harvest Viewer Experience Competition (the Competition) will be run by Cardova Trading (Pty) Ltd (the Organizers/we/us) in association with Sea Harvest Corporation (Pty) Ltd.
1.2. Each person entering the Competition and/or accepting a Prize in terms of this Competition agrees and accepts that the Competition rules as set out in these terms and conditions are binding on him/her. Entries for the Competition will open at 16h00 Thursday, 25 May 2017 and will close at 17h00 on Friday, 13 June 2017 (Competition Period). 4.1. Reply to the Sea Harvest Viewer Experience Competition post that is posted on the Afternoon Express Facebook page (www.facebook.com/afternoonexpress) during the Competition Period and respond to the post in the manner specified in the post. Entrants must submit an original recipe using a Sea Harvest product accompanied by a photo of the prepared dish. 4.3. There is no restriction on the number of times you may enter, provided that each entry is unique (i.e. not the same answer and/or photo). 4.5. If your entry is submitted in a manner that in the sole discretion of the Organizers will provide you with an unfair advantage over other entrants, you will be disqualified from the Competition. 5.1. A panel of judges, who are appointed by us, will select 1 (one) person (Winner) from all valid entries as the winner of the Prize within 3 (three) days from the closing date of the Competition, subject to clauses 5.3 and 7.2. The Winners will be the entrants who are determined in the sole and unfettered discretion of the judges as the entrants who submitted the most entertaining and creative entries. 5.2. We will notify the Winner by commenting on the Winner’s entry post within 24 (twenty-four) hours from determination of the Winner to request a copy of the Winner’s identification document in order to validate his/her entry and to request further contact details. The Winner will be required to provide an electronic copy of his/her identification document within 24 (twenty-four) hours from being requested by us, failing which the Winner will forfeit the Prize and have no claim against us. 6.1.1. In the event that the winner resides outside the Western Cape, we shall provide economy class return flights from a major airport in South Africa. 6.1.2. The Winner will be responsible for their own transport to and from the airport in their city, if applicable in terms of 6.1.1. 6.1.3. The Winner will be provided transport to and from the airport in Cape Town, if applicable in terms of 6.1.1. 6.1.4. If the Winner is under the age of 18 years, he/she must provide written consent from his/her parent or legal guardian in order to appear on Afternoon Express. 6.1.5. The Winner must be available on for the whole day on 22 June 2017, or such other date determined by us, failing which this portion of the Prize shall be forfeited and we reserve the right to award it to the runner up. In the event that the Winner is unable return home on 22 June 2017 after the appearance on Afternoon Express, we will arrange for accommodation in Cape Town for the Winner. 6.3. The Prize excludes all items not mentioned in clause 6.1 and 6.2 may differ from images or items used in marketing material for the Competition. 6.4. We will contact the Winner to make necessary arrangement for the appearance on Afternoon Express and to receive all necessary information to deliver the Hamper and the Hamper shall be delivered to the Winner at an address within the Republic of South Africa within 20 (twenty) business days from confirmation of the Winner. 7.1. Any reference to the Organizers/we/us/our includes the directors, members, partners, sponsors, agents or consultants of the Organizers, where the context allows for it. .7.4. The Organizers’ decision regarding any matter concerning the Competition and/or arising out of these terms and conditions, including the determination of the Winner, is final and no correspondence will be entered into. 7.6. Nothing in these terms and conditions is intended to, or must be understood to, unlawfully restrict, limit or avoid any rights or obligations, as the case may be, created for either the entrants or the Organizers in terms of the Consumer Protection Act, 68 of 2008.